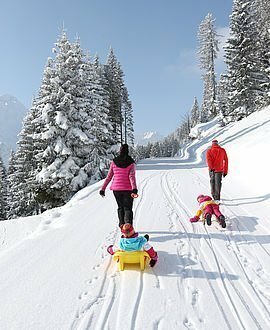 Kleinwalsertal in Vorarlberg is perfect for a winter holiday with children, or a winter holiday with the baby. Kinderhotel Alphotel provides everything families need. 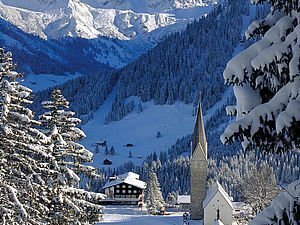 In conjunction with Oberstdorf, the biggest Austro-German ski area really has something to offer. 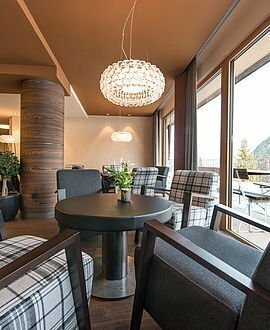 A superb location in the midst of the most fantastic natural surroundings, a stunning mountainscape, a wonder-ful ski area and the contemporary comfort of a very well equipped children’s and family hotel. 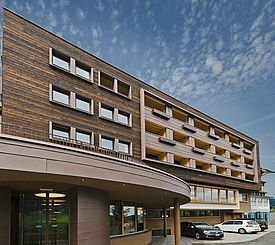 Welcome to the Kinderhotel and Familienhotel Alphotel. The Kleinwalsertal, a high mountain valley in the Allgäu Alps, is a special place in geographical terms. Almost completely surrounded by high mountains it is – although it wholly belongs to Austria – only accessible from Germany by car. 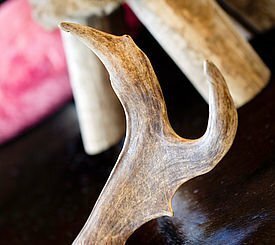 It is the impressive mountains in particular and the proverbial Walser hospitality which lends itself to a fascinating leisure and holiday destination with an all-round pleasant atmosphere, in summer and winter alike. A holiday in Austria: right in the middle of Germany! Kleinwalsertal is Austrian, even though in location terms it is like an island in Germany. It is precisely this island way of thinking that makes it so attractive for a winter holiday with children, or a winter holiday with your baby. Easily accessible to all German cities, it offers pure Austrian hospitality and the alpine charm of the Austrian mountain valleys. 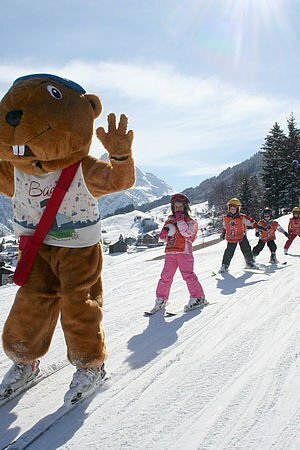 There is also an extensive programme of leisure events which makes a winter holiday in Austria so unique. 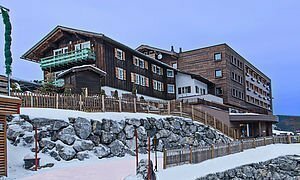 The range on offer extends from skiing to snowboarding, tobogganing, cross-country skiing and winter hiking through to wellness in Familienhotel Alphotel and an extensive programme of children’s events also in your Familienhotel! 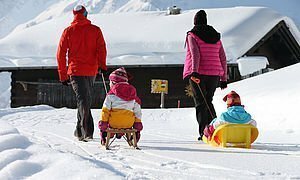 A winter holiday with the children which has the fun factor! The Kleinwalsertal ski region welcomes you during your winter holiday in Austria with 10 gondola lifts, 13 chairlifts and 23 T-bar lifts, over 120 km pistes and two fun parks. 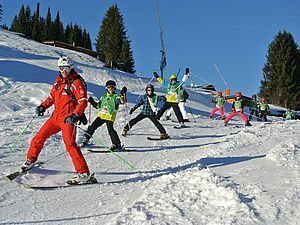 So the skiing theme in Kleinwalsertal means there is something for everyone, from beginner to genuine freeride and mogul piste specialists. 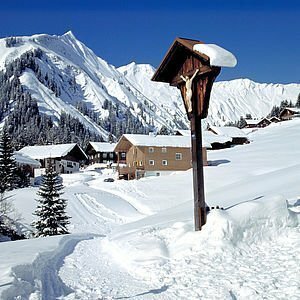 Kleinwalsertal also has things going on when it comes to winter hiking, cross-country skiing, dog-sled rides and tobogganing. 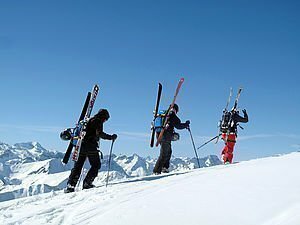 There is a versatile winter sports range on offer – a natural curling rink, horse-drawn sled rides, 50 km winter hiking trails, 8 skiing and snowboard schools, guided tours – snow-shoe hiking, ski tours, Nordic Walking, telemark, snowbiking. 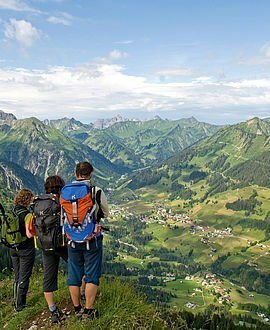 Kleinwalsertal also has museums, ski exhibitions, a mountain exhibition and the Breitachklamm. The Kanzelwandbahn and the Fellhornbahn connect the Kleinwalsertal ski area to areas in the Allgäu, where the Kanzelwand, with 15 km of moderately difficult descents, awaits. Cross-country skiing is covered with 7 slopes covering a length of around 50 km, in classic style and also for skaters.